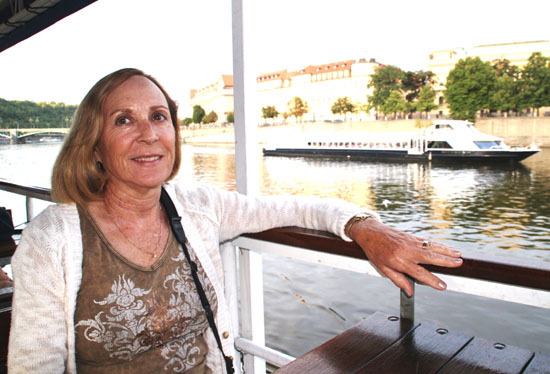 Scenic sights of Prague from our dinner cruise on the Vltava River. 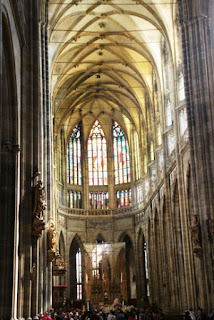 One of the reasons for choosing our AmaWaterways Danube River Cruise was that we could include a three-day pre-cruise visit to Prague, Czech Republic. 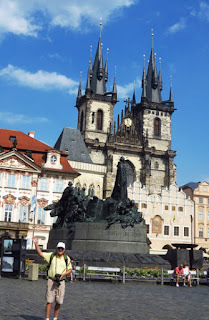 This well-preserved medieval city is a destination that attracts crowds (six million people a year--tourism is the main industry), but we had heard raves about the city and wanted to put it on our itinerary. Enjoying the sights from our evening river tour. Our first evening there, we scheduled a dinner cruise on the Vltava River, the city's main waterway, which gave us a good overview of the city at a slower pace. Our hotel was located in Old Town, a section of the city in which no new buildings are allowed, the better to preserve the character and architecture that people come to see and appreciate. Although Czechoslovakia was a republic in 1938, the Nazi occupation brought a lot of suffering and neglect to the city. When the Communist regime ended peacefully in 1989, restoration of historical and cultural buildings began. You can take a city tour by bus to get acquainted with Prague; most will offer stops along the way. Or take a free walking tour. Many of these meet in the morning near the 600-year-old Astronomical Clock in Old Town Square for a half-day tour. You’ll get an overview and some history of several main sites like Charles Bridge, Prague Castle, and Jewish Quarter. ﻿﻿As you walk on your own, head towards the river to visit the John Lennon wall. As Communism was declining in the 1980s, students painted grievances on the wall and wrote John Lennon lyrics to promote love and peace. If you wish to join the sentiments, it’s okay--tourists are allowed to write or paint on the wall, too. 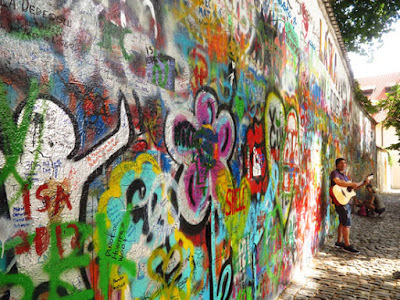 Street musicians hang out at the John Lennon wall in Prague. While you’re near the waterfront, take time to relax and dine in one of the area restaurants or cafes. 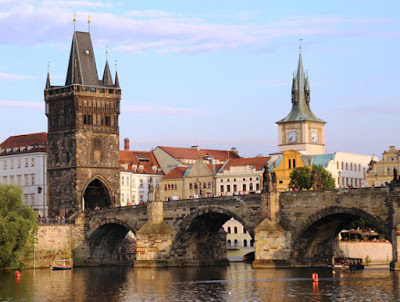 When you’re ready to head back towards the city center, you can walk across the famous Charles Bridge, which connects Old Town and New Town. have time for. They are all beautiful. Charles Square features seven churches; and while you may not enjoy touring that many ancient cathedrals, it’s worth checking out one or two. Few still have services, since religion isn’t prominent in Prague, but most are beautifully decorated in a traditional Catholic manner. People-watching is a cherished past time at Old Town Square, It’s full of tourists and locals, and you’ll be entertained by any number of musicians. From jazz to bagpipes, a wide variety of street musicians love performing in the Square. 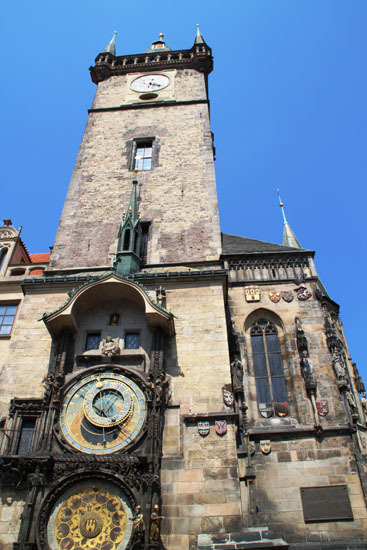 If you’re in the Square on the hour, listen for the Astronomical Clock chimes and watch puppets appear briefly in the open doors of the tower. For some reason, hundreds of people line up to see this attraction, even though there’s not much to it. Still, take time to observe the artistry of the clock, regarded as one of the most beautiful in Europe. 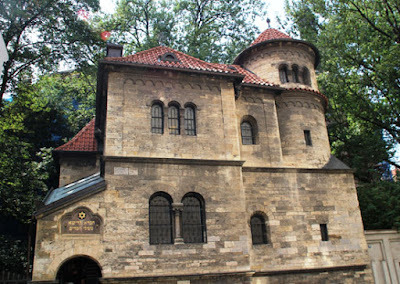 Whether you’re Jewish or not, the Jewish Quarter is worth taking time to see. Hitler intended to make it a museum commemorate what he expected to be an extinct Jewish race, so he saved it from destruction during World War II. Ironically, now the modernized synagogues and historic graveyard honor what was one of the largest Jewish communities in Europe. For contrast, walk down fashionable Paris Street (Pariszska) and window shop the luxury boutiques with famous brand names. It’s a well-kept, contemporary area that contrasts with the historic old town section. Our last day in Prague, I found a beautiful locally made crystal bowl to remember our visit to this remarkable city. What a great place that lies at the intersection of east and west as progress yearns in motion. I can't wait to visit as well. I really want to try their local cuisine. Traditional Czech food is indeed delicious. We found it to be reasonably priced, too.